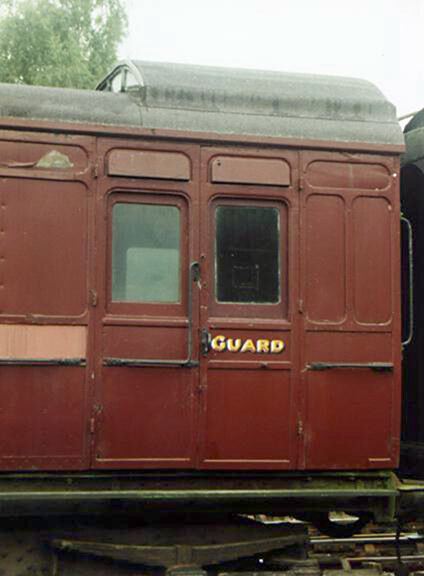 This coach has a distinctive raised guard's lookout, called a birdcage. 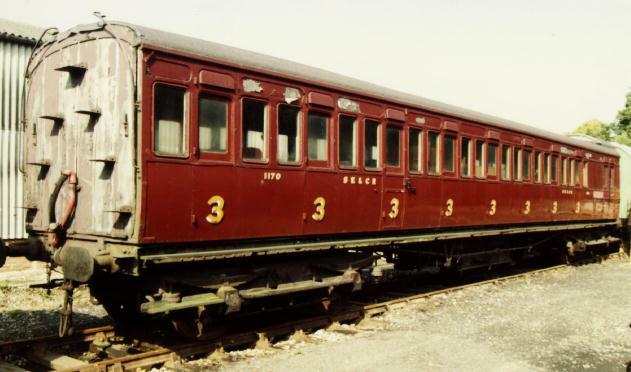 It formed one coach of a "Trio C" birdcage set, the classic branch line train of the South-east of England. After withdrawal it was totally gutted internally, and used as a mobile staff classroom. It was purchased to form the third coach for our Birdcage Set, but it was not a good match for No.1061, being considerably longer, if only three years newer. With a well stripped interior and suspect structural condition, it has now been relieved of its "duty" in this respect by the arrival of 50' Birdcage brake No.1084. It appears superficially reasonably sound, but would probably require considerable work on the doors, some of which have been sealed up for the best part of thirty years. No interior exists for this coach, but, being of a plain design this should not cause any serious problems for its eventual restoration. Whilst the roof was still waterproof it was not tarpaulined, but this has now been done, to ensure the coach's survival until such time as it can be overhauled. One possibility for its future, now that there are two other Birdcage brakes on the Bluebell, is a conversion to a pull-push driving trailer, since one of this diagram was so converted. If this were done, clearly the birdcage end should be retained for posterity and might form an interesting exhibit in a museum.